Central Electricity Regulatory Commission introduced REC mechanism to ease the purchase of renewable energy by the state utilities and obligated entities, including the states which are not well endowed with RE sources. REC framework seeks to create a national level market for renewable generators to recover their cost. One REC (Renewable Energy Certificate) represents 1 MWh of energy generated from renewable sources. Under the REC mechanism, a generator can generate electricity through the renewable resources in any part of the country. 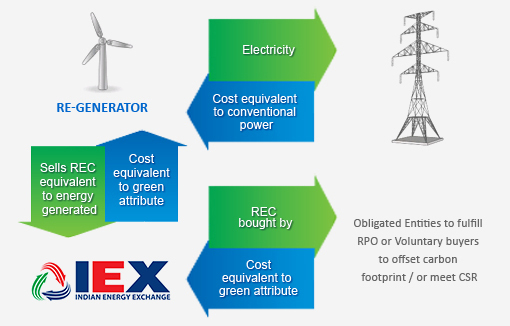 For the electricity part, the generator receives the cost equivalent to that from any conventional source while the environment attribute is sold through the exchanges at the market determined price. The obligated entity from any part of the country can purchase these RECs to meet its RPO compliance.